this weekend i will be in cleveland with all the normal craft fair fare – the yarn, the hats, the book… and with my friend gwen for company. it should be a fun show and you should come see us if you’re around. click here for details of the show. here’s a flashback photo from the last time gwen and i were there together… 2 years ago. look at all that handspun! i have a total of 3! skeins left for this show this year. 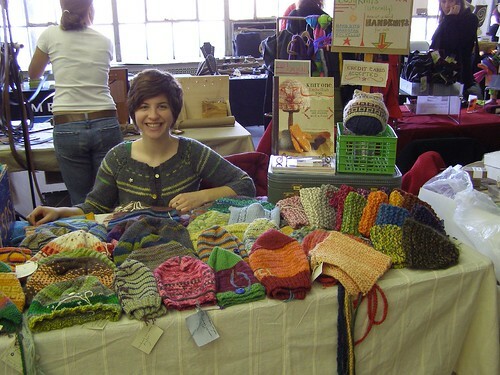 i’ll have to spin a bunch for the yarn shows in feb and march, that’s for sure. 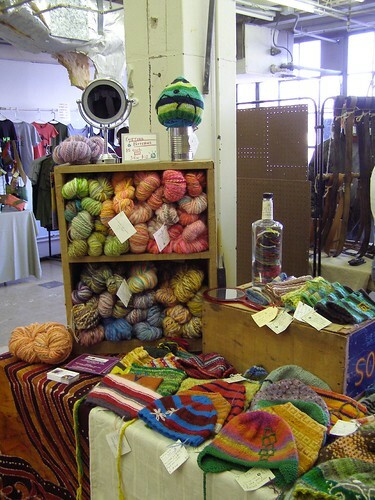 but i must say, i have loads of the hand dyed stuff, so it fills the spot. Weee! I’m excited! Can’t believe it’s been 2 years since that trip. I just got all wiped out on yarn too. We’ve got spinning to dooooo! !